First, the update. Evie's neurology appointment was fine. She actually only went from 50 to 50 1/4 cm in the 6 weeks since the last appointment, and is still on "her" curve -- albeit way over the normal curves. We go back in 3 months for another check. The appointment would have been fine, if we didn't have to wait 45 minutes. I had both girls, by myself, and they played like angels for the first like 35 minutes. Evie would take her two balls to the nearest other patient and hand one to them. Then take it back and hand them the other. And keep doing it. And doing it. And yeh, doing it again. One old man was having a great time. Lily sat at the little table and chairs nearly the whole time and played with the same toy, over and over again. Then, they got tired. And cranky. And by the time we were called in, Evie was rolling around on the ground yelling and Lily was climbing everything in sight -- the chair, the stool, the other chair, crawling under the desk. It was nuts. Ok, enough of that. Some pictures!!! 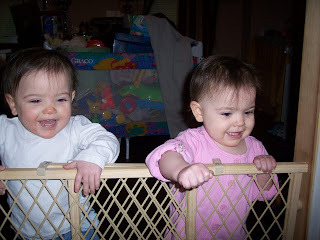 I don't exactly remember what the heck had them laughing so hard, but I THINK it was the cats when we first got them and the girls weren't used to seeing them running around. NOW, they are quite used to them and Blue will sleep anywhere. Lily didn't seem to mind. 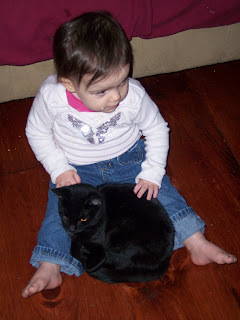 She just pet her a little and the cat was in kitty heaven. I'm glad the girls know not to grab and smack the cats. AND Evie. What can you say about her? 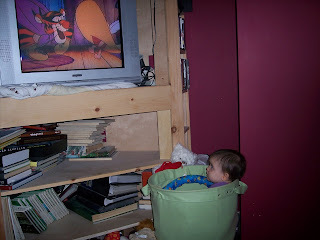 She climbed into that toy basket all by herself and was just happily watching Pooh entirely too close to the television. I don't know HOW that could be remotely comfortable with all those hard toys in there, but she was content. So cute. The pic of her in the toy basket is so great, the places kids will go. I am happy to hear things went good overall with Evie's appointment. (maybe I should invent something like that?!) Anyways... The girls are soooo cute! I love the bin picture! he he... I can't believe she stayed in it! Oh, they are so stinking cute - love that last basket picture!! Yes - I have sort-of bangs and not they are not difficult to have - I have to have bangs due to my HUGE forehead. GO FOR IT! Ha! I am laughing at Lala's comment, because last time I went to urgent care they gave me a light up vibrating thing just like you get in restaurants!! Sorry, Erin! You could've been rich!